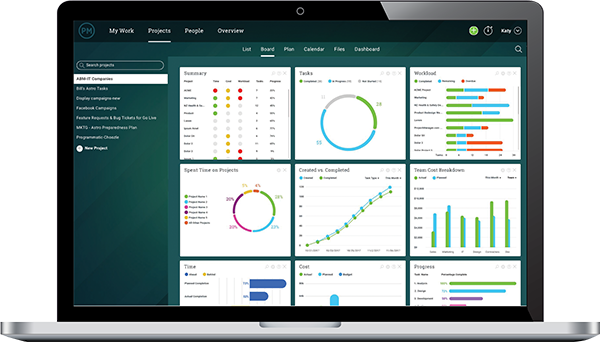 With no hardware rollouts, training requirements or software to download, it’s quicker and easier to get started with ProjectManager.com. And, with features like interactive Gantt charts, task management tools and reporting tools, you’ll be glad you started as soon as possible. ProjectManager.com makes it easy to make a new project, add team members, and assign tasks. We give you the option to start from scratch, use a template, emulate a sample project or even upload an existing Microsoft Project or Excel plan. If you want to plan, schedule and track your projects and your team with efficiency, then read on to learn the simple steps to getting started with our online project management software. Here are 5 easy steps to starting your first project. Of course, you can’t make a project until you sign up for a free trial! Visit our pricing page to choose the pricing plan and feature set that works for you, then enter your information and voilà, you’re in ProjectManager.com. To access your projects at anytime, all you have to do is sign into your account at ProjectManager.com. Which, by the way, can be done on any computer and any browser from anywhere in the world! The next thing to do is give your project a name. Make it fun and understandable because it’s likely your team will be viewing and working on this project as well. If you want to add more parameters to your project, simply click the “more” button under the project name field. Here you can write a project description, set working days, a budget, a working rate and user access permissions. Now that your project is made, you can start setting up your tasks. You can begin typing tasks into the task name field on the spreadsheet, or you can import an existing task list to this project. For optimal organization, you can group tasks by team or into project phases, and then you can organize them by color. You can also create subtasks by indenting tasks under a major task, and even add milestones if you’d like. To add more details to your tasks, you can add more columns. Simply click the grey horizontal header above the columns, and dozens of KPIs (planned duration, planned finish date, etc.) will appear that you can apply to your data graph. You can also create custom columns for more granularity of data. You will notice that as you add tasks, they have been populated on the Gantt chart as dots representing the start and end date of each task. By default, this is set to one day, but you can drag and drop each task date to easily schedule tasks with later due dates or longer duration. Now that you’ve made your tasks, it’s time to assign them to team members. To assign a task, simply find your task row, then scroll to the right until you find the “Assigned” column. Click the cell and choose which team member(s) you would like to assign the task to. From this view, you can also assign hours across multiple team members, dictating the responsibility and work required from each person. If you need to assign a task to a person who isn’t in the system yet, click the “Add Person” button at the bottom of the box. Here you can simultaneously add a new team member and assign them a task with the same form. They will receive an email invitation to join ProjectManager.com, along with their task assignment. Before your team members sign in and view their task assignments, add instructions, comments and attachments to their tasks so they have a specific directive. This way, they know exactly what they have to do to accomplish the task, and they have been given the means to do so. All of these instructions and attachments and comments exist on the task level, so your team members don’t have to fish around to find information. It’s all located in one convenient place! And, as your team members work on their tasks, you can view the progress with task bar shading in the same Gantt chart view. To see all of these steps in a helpful “how to” video, click the play button below. It’s So Easy, Why Wait? Now that you know exactly how easy it is to make your first project at ProjectManager.com, there’s no reason not to try us out for free. Start your free 30-day trial and make every project a success.